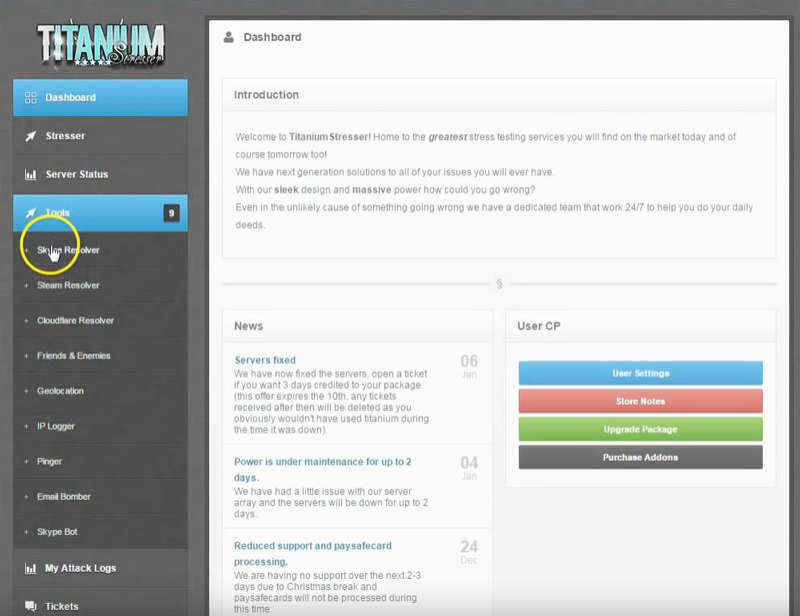 A 20-year-old man from the United Kingdom was sentenced to two years in prison today after admitting to operating and selling access to “Titanium Stresser,” a simple-to-use service that let paying customers launch crippling online attacks against Web sites and individual Internet users. Adam Mudd of Hertfordshire, U.K. admitted to three counts of computer misuse connected with his creating and operating the attack service, also known as a “stresser” or “booter” tool. Services like Titanium Stresser coordinate so-called “distributed denial-of-service” or DDoS attacks that hurl huge barrages of junk data at a site in a bid to make it crash or become otherwise unreachable to legitimate visitors. According to U.K. prosecutors, Mudd’s Titanium Stresser service was used by others in more than 1.7 million denial-of-service attacks against victims worldwide, with most countries in the world affected at some point. He originally built the booter service at the age of 15, earning more than $300,000 in ill-gotten gains from it. Also during his interviews, he admitted security breaches against his own college while he was there studying computer science. Mudd pleaded guilty to three offences under the U.K. Computer Misuse Act and a further offense of money laundering under the Proceeds of Crime Act in October 2016. “Today, he was sentenced to 24 months imprisonment for his own DDoS attacks, nine months for running a titanium stressor service and 24 months for money laundering the proceeds made from the stressor service, all to run concurrently,” reads a press release issued by the Eastern Region Special Operations Unit (ERSOU), an anti-cybercrime unit that worked with the U.K.’s National Crime Agency to investigate Mudd. Detective Chief Inspector Martin Peters of the ERSOU’s Regional Crime Unit recalled that at sentencing the judge said the defendant likely would have received six years if he’d been tried as an adult and if he had no medical issues. Mudd had been slated to be sentenced last week, but that hearing was delayed until today after the court heard medical testimony on Mudd’s apparent struggles with autism. The Mudd case is the latest in a string of law enforcement actions in the U.K., U.S. and elsewhere targeting booter service operators and their customers. In December 2016, federal investigators in the United States and Europe arrested nearly three-dozen people suspected of patronizing booter services. That crackdown was part of an effort by authorities to weaken demand for booter and stresser services and to impress upon customers that hiring someone to launch cyberattacks on your behalf can land you in jail.